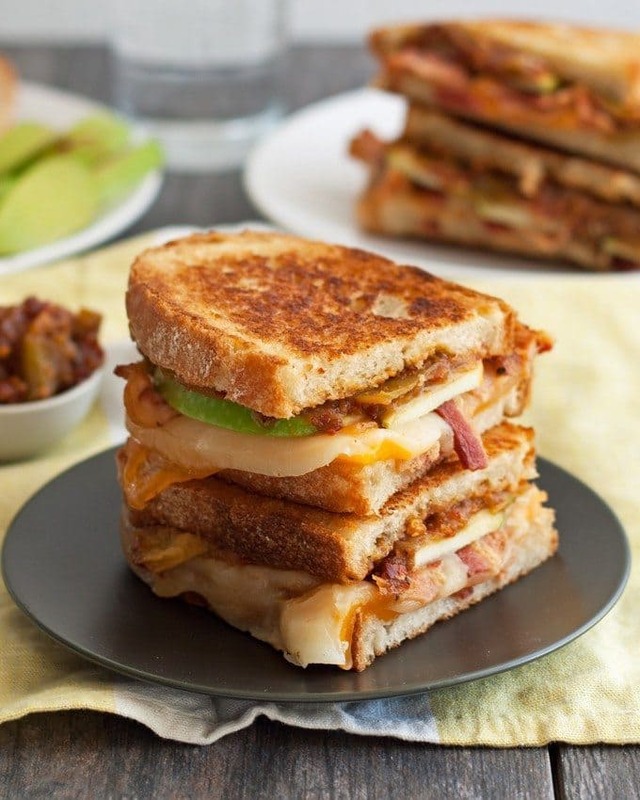 These spicy apple bacon grilled cheese sandwiches are going to add some heat to your lunch. 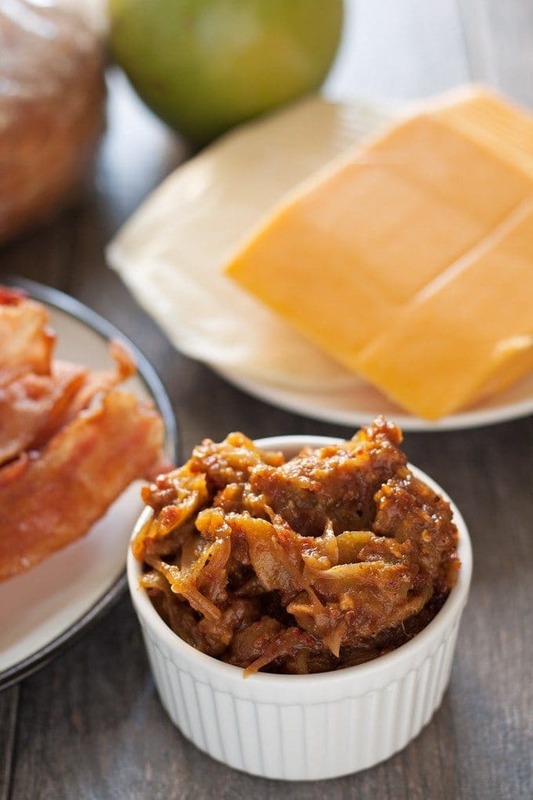 The sweet and spicy apple relish is my favorite part and pairs perfectly with the cheese and bacon. It’s time for the third edition of #FreakyFriday! Back in February, I participated in the first edition of this blog hop and shared these delicious chicken fajitas. Then in June, for the second edition, I shared this awesome slow cooker taco dip. Mr. B has been thrilled that I joined this blog hop and wants me to do it for all of eternity. Not only did the Honey and Birch headquarters get to eat some really great food, but it was so much fun to make and share another blogger’s recipe. You may be wondering what the Freaky Friday Blog Hop is. Each of us bloggers (there are 15 of us this round!) was secretly given another blog to choose a recipe from to then recreate. Today, we all published our posts at the same time and found out who was assigned our blog. I find the whole process very exciting – I love being able to pick any recipe I want from a website full of fantastic dishes. Plus, there is a fun anticipation in waiting to see who you is making one of your recipes and seeing what they chose. And now it is time for the big reveal. My secret Freaky Friday blogger is…… Dini from The Flavor Bender! To say that I was excited to be assigned Dini’s blog is kind of an understatement. I have been reading Dini’s blog for a long time and I have always been impressed with her blogging style and her recipes. Dini goes in to the most incredible detail when posting recipes – when she publishes a new blog post, I know that I am going to learn the history and the technique. For a self-taught cook like myself, it is perfect. When you make her recipes, you end up with a full stomach and a brain full of knowledge. Picking a recipe to make for this blog hop was difficult. I actually made two of the recipes from The Flavor Bender and then picked the recipe with the better photos. The other recipe is her butter chicken recipe – it was delicious and the first time I ever cooked Indian food. I actually served it to Mr. B and his two friends and it received 6 thumbs up! and about 50 more. I think you would have a hard time narrowing it down too! Although it was difficult, narrow it down I did and this apple and bacon grilled cheese sandwich was the winner. Holy delicious. I added the word spicy in front because that sweet and spicy apple relish is no joke. I made it as written but I changed the amount in my directions. Mr. B and I are big fans of spicy food and this was a little too spicy for us. My mouth tried to revolt but I wouldn’t let it. Because this grilled cheese sandwich is so good I wanted to eat, like, 10 of them. Make the apple relish a few hours (or a day) before so that it is ready to go when you get hungry. Heat 2 tbsp of oil in a small saucepan. When the oil is hot, add the sugar, salt and onion and cook until the onion is translucent and the sugar has melted. Add the sliced apple, chili flakes, ground pepper and vinegar and cook on medium heat until the apple softens and the onions and apples start to caramelize (approximately 20 minutes.) Stir frequently to prevent burning. Store in an airtight container in the fridge until ready to use. Heat a griddle or pan over medium heat. Butter 2 bread slices on both sides. Place the slices on the pan to slightly brown one side. Remove the bread from the pan and spread a layer of spicy apple relish on the browned side of one piece. Add 3 slices of green apple on top of the relish. Place 3 pieces of bacon on top of the apples. Top with 2 pieces cheddar and 2 pieces provolone cheese. Recipe from The Flavor Bender. Are you interested in which recipes the other bloggers picked? Check the blogs out here or scroll down to access all of the posts! Please stop by and visit the rest the other blogs participating in Freaky Friday…you just might find a new favorite recipe! WOW! This sounds incredible!!! I love the apple in there especially, perfect quick meal! Thanks Angela! Dini is quite a genius! Wow, what an awesome idea for a grilled cheese! Lol, we ate it and our eyes and mouths were watering but we couldn’t stop. The flavors are fantastic! Thank you for always making such great recipes – it was really a struggle picking which recipe I should share. You are too kind Michaela!! We are going to have a blast next month!! That apple relish sounds fantastic! I like spicy food too and Dini’s blog is one of my favorites! I am definitely making this soon! I love everything about this recipe! This looks absolutely AMAZING. I want that apple relish on everything! Talk about a delicious looking grilled cheese! I love Dini’s recipes; they are all so unique and fun. You did an amazing job on this one, Jenny! I totally want to try it! 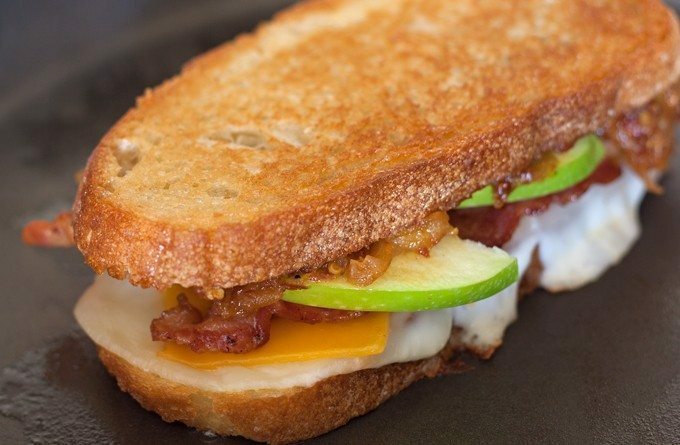 I need this Spicy Apple Bacon Grilled Cheese in my life! That Spicy Apple sounds AMAZING! This has to be the best looking grilled cheese sandwich I have ever seen! I’ve never been to Dini’s blog before today, thank you for introducing me to her! Her recipes sound amazing! She is awesome! 😉 I hope you enjoy her recipes as much as I do!! OH man this looks like one killer grilled cheese sandwich! Love love love the flavors in this sandwich! Adding it to my menu plan for next week! What a fun blog hop! This grilled cheese looks amazing, so many great flavors! WHAT a sandwich! I’ve never put apples in my sandwich. I may need to tone down the relish a bit because I’m not a big spicy person, but it looks so delicious I’m willing to give it a try! The original recipe called for 3 tablespoons, I reduced it to 1 – maybe try 1/2? Totally making this today–we have nasty rainy weather here in Carolinas again and grilled cheese is what our souls need! I agree. <3 grilled cheese. Jenny, those photos make me want to make this sandwich right now! I love the combo of cheese and apples, but the bacon takes it over the top. Pinned! Shhhhhhh. Just Shhhhhh. You had me at spicy apple bacon. This is such a crazy good idea for grilled cheese! Apples + cheese go so well together so I can imagine how delicious this is! oh my does this look amazing! Thank you for sharing at share it One More Time.. I totally need a panini maker! Its on my to-buy list! Now this is my kinda lunch! My hubby would flip over the sweet and savory combo! It’s so good Meg, I hope you and he give it a try! I’ve never had this combination! Sounds yummy! 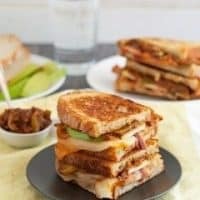 Thanks so much for sharing this awesome grilled cheese recipe with us at Cooking and Crafting with J & J.
I hope you have a nice week and hope to see you again. My dining hall in college had an apple grilled cheese special every now and then- it was one of my favorites. This looks like a gourmet version! Can’t wait to make it. 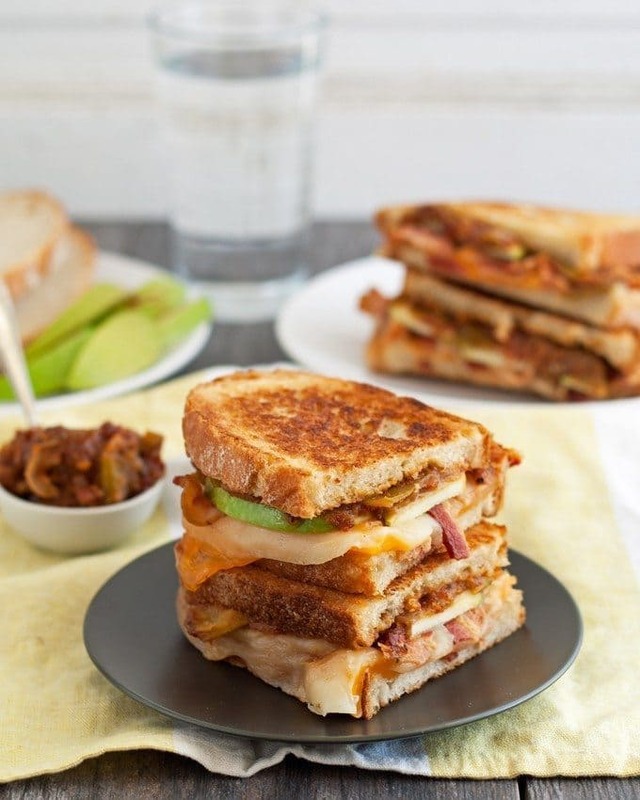 This grilled cheese with the spicy apple relish sounds amazing! Thanks for sharing at What’d You Do This Weekend?! What a fun idea for a blog hop! I wish I’d thought of it. And this sandwich…well I may be biased…I’m also a fan of The Flavor Bender…but it looks downright delicious. Thanks for bringing it to #SaucySaturdays. This sandwich looks delicious! What a creative idea! Thanks for linking up with What’s Cookin’ Wednesday!